Google Chrome is a brand new browser by Google. It has alot of features: such as the Security site and UI site. At the UI side, the Chrome seperate each windows into tabs and each tab actually is a process. You can try to open 3 tabs in your Chrome and you will find out 3 child process under your Google Chrome parent process. This helps to give a boundary to each process so that malware cannot affect other tab or even your browser. Actually the navigation UI very similar to Safari browser. The new tab page even can shown all the recently visited pages or websites and because of each of the tab is separated into process it makes the posibility to detach your tab into new window of Chrome very fast and easy, or vise versa. 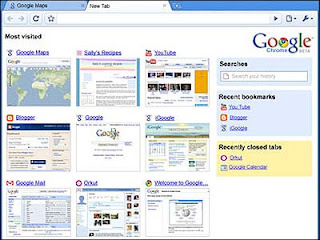 Omnibox is applied in the address bar. It allow you to key in some related keywords and press “TAB”, some of the auto complete list is listed there. http://en.wikipedia.org /wiki/Google_Chrome. Another thing that I was wondering is Google Chrome just introduced today but the Wiki page already ready. Some improvements are near invisible. For example, each of the tabs in a window will be powered separately. What does it really mean? It means that if one tab gets corrupted, the browser doesn’t crash that making you lose the rest of the tabs as well.